LEADING THE WAY… From left, the Murray Bushrangers 2019 leadership group, Meg Todhunter (Wodonga Raiders), Millie Brown – captain (Mooroopna), Sophie Locke - vice captain (Seymour), Abby Favell (Griffith Swans), Mikaela Trethowan - vice captain (Thurgoona Bulldogs) and Kate Adams (Shepparton United). Photo: Will Adams. LEADING THE WAY… From left, the Murray Bushrangers 2019 leadership group, Meg Todhunter (Wodonga Raiders), Millie Brown – captain (Mooroopna), Sophie Locke – vice captain (Seymour), Abby Favell (Griffith Swans), Mikaela Trethowan – vice captain (Thurgoona Bulldogs) and Kate Adams (Shepparton United). Photo: Will Adams. THE Murray Bushrangers celebrated the launch of its 2019 season with a training day and jumper presentation on Saturday, where the women’s U18 and Futures Squad were announced. Female talent coordinator, Briana Cossar said, “More than 80 young females from across the region have participated in the elite level football training program over the past three months. This has included AFLW testing components and intra club games throughout the pre-season program to ensure players have both the football and athletic attributes to perform in the elite U18 competition. The squad of 52 players includes 23 ‘Futures’ (U16) players and is represented by 18 clubs from across the North East Border, Goulburn Murray and Southern NSW regions. “This highlights the strong growth in community football programs and dedicated coaches and volunteers who all help provide a terrific platform, developing the girls into football players and preparing them for the elite football program we provide,” Cossar said. 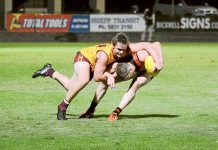 The team is preparing for their round one match against Northern Knights at RAMS Arena, Craigieburn on Saturday, March 2.